Mizzou head coach Gary Pinkel said that sixth year offensive tackle Elvis Fisher will play this Saturday when the Tigers host Vanderbilt at 6 p.m. Jack Meiners will also play despite a bad knee bruise, which is good news for an offensive line that is struggling. The problem is Pinkel can’t answer how many reps either of those veteran players will get. 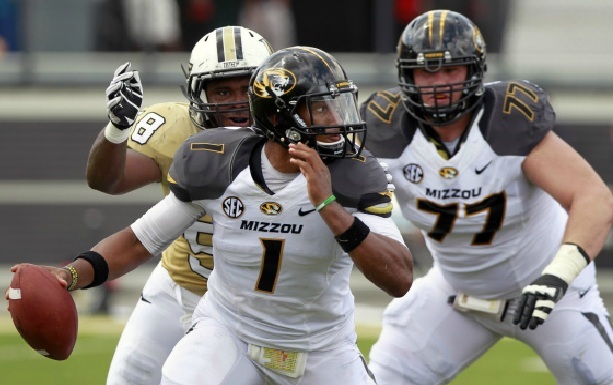 At this point Pinkel will take any good news as a victory for an offensive line that has struggled throughout the year, so much to the point that Mizzou fans were calling for a switch at quarterback. The problem with the offense goes much deeper than James Franklin and it starts up front. First, to clarify some misconceptions about this Mizzou offense. Franklin is a better quarterback then Corbin Berstresser. The offensive play calling was “dummied down” for Berkstresser in that ASU game. The number of options and the difficulty of the reads that Berkstresser had to make were all scaled back by offensive coordinator David Yost. Berkstresser’s touchdown against USC came in the final minute of a blowout game against backups. Hardly the same type of competition that Franklin faced in the game from the sixth ranked team in the country. Franklin admitted after the USC game he was hesitant to throw downfield because he still felt pain in his shoulder and it was more of a confidence issue of getting over the hump, knowing his arm would be strong enough to make throws downfield. In fact, Pinkel said Franklin’s shoulder is a non- issue. That was evident in Saturday’s game against Central Florida. Franklin hit DGB on an 80 yard catch and run and he threw the ball down the field with confidence. Not Franklin’s fault. Pinkel said the wrong route was run. The receiver was supposed to cut across the middle instead of running a slant. Franklin threw the ball where he expected the receiver to go…not where the receiver actually went. Don’t even get me started on the fact that there were six or seven bad snaps that Franklin had to corral before he could even look up field to make a play. Pinkel says he’s never seen a game where his team has allowed that many sacks. UCF pass rushers were getting a good one or two yard push into the backfield before Franklin could catch the snap, set his feet and look down field. As you’ll hear from Pinkel, he says the Tigers are not just hoping the issue of center-quarterback exchanges gets fixed on its own. He says Mitch Morse, the sophomore from Austin, Texas is working hard every day to fix the problem. I talked with Mitch on Monday afternoon and the 6’5, 295 pound lineman (who chose Mizzou over KU and Vanderbilt), said quite frankly he’s getting tired of putting his close friend through this every week. Morse would most likely not even been playing much this year if it weren’t for injuries, but Pinkel still has faith in the team’s most improved offensive lineman from the spring.